A few tricks I have learned is using themed, high-interest materials and exposing students to the same material over time to build confidence. Try a week for FREE!Scroll down in this post. For my Read and Write like a Rock Star lessons, I slip all of my black lines and lessons for each month into a three-pronged flexible folder. This makes for easy organization and it doesn’t take up a lot of space. I like this more than file folders because each theme (there are four in each monthly pack) stays together. I keep each theme organized together. This makes it easy to see everything and pull the pages to make quick copies for the week! See the activities in action! I copy these two pages front to back. Please note: only my high kiddos can write sentences on their own at this point in the school year. With many of my students, we skip writing it on their own, or I write the sentence again in highlighter and they trace. 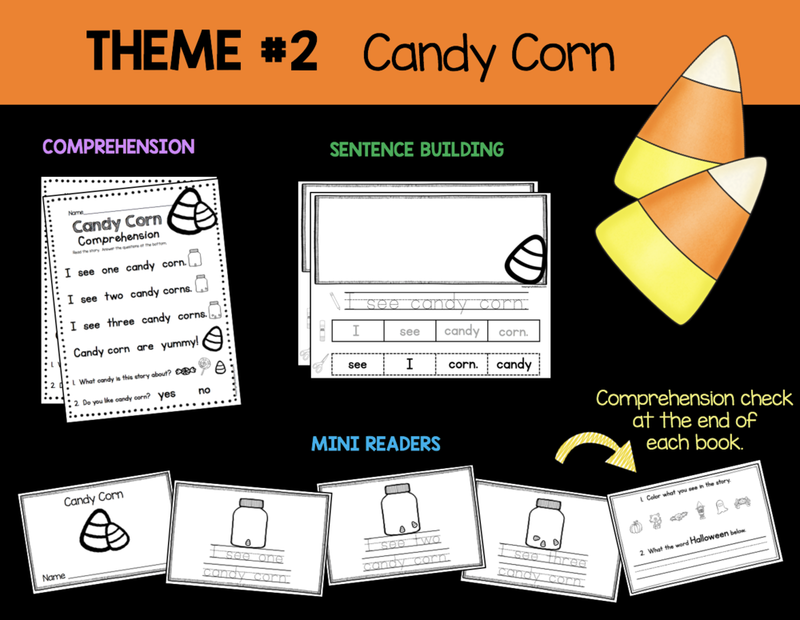 As the year progresses, my students can all begin to write on their own - see my other monthly packs! Finally, students flip their paper over and they write the sentence two times on their own. The sentence structure and comprehension questions (on the last page of each book) get progressively harder in each monthly pack throughout the year. I read it to them, then we read it whole group chorally and then students practice reading to each other. Then, they can trace the sentences and we answer the comprehension questions on the back page. Students love to take their books home each week to read to their families! My kiddos LOVE working hard and completing their work because they then get to color in their stars. You can have a bulletin board with each kiddo’s chart on it so they can easily keep track and see their progress. When they complete an assignment, they can color the coordinating star on their chart. You can also keep these charts in a folder, or if you choose to use this as homework just keep it in their HW folder! Parents catch on to this super quick too and its adorable how excited kids get to color their stars. The pictures of each assignment makes it super easy for them to find and color the correct star. You can choose to give a prize at the end of the month, or just do extra free time, a sticker, etc. 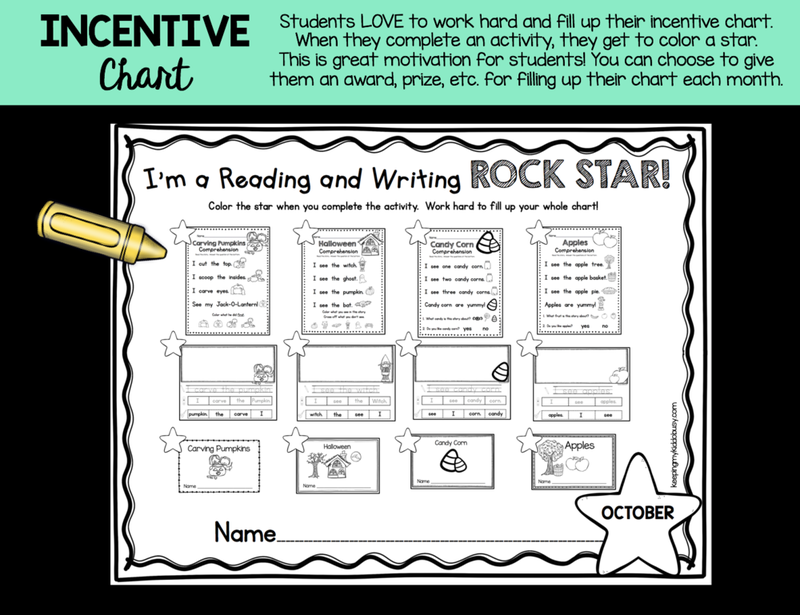 These charts are included in every monthly Read and Write like a Rock Star pack! Each week print and copy a new theme for students. Try the Carving Pumpkins theme for FREE! Sign up for our Exclusive Freebie Library at the bottom of this page.